The ground around the hot springs is muddy and not suitable for bathing. Located within the scenic Toad River valley of the Muskwa Foothills, Toad River Hot Springs Provincial Park protects a regionally significant hot springs ecosystem. Visitors to the area will most likely observe wildlife, such as moose, supplementing their diets with minerals found at the hot springs. Toad River Hot Springs Provincial Park is located along the Toad River within the Muskwa – Kechika Management Area, about 160 km west of Fort Nelson and 25 km east of Muncho Lake Provincial Park. The hot springs are situated on the left bank of the Toad River about 1 km upstream of its confluence with the Racing River. Access is via river boat or horseback. Currently, use is limited by access but there is some regular recreational use. History: The Fort Nelson Indian Band and Kaska Dena First Nations traditionally use the area. With the European demand for fur, trappers moved into the area during the early 1800’s. Since that time the popularity of the area has increased with hunting, fishing, and recreational boating avidly pursued. The significance of the hot springs first prompted the area to be set aside as a recreation reserve. The hot springs were then proposed as an ecological reserve in 1974. Site surveys were undertaken by B.C. Hydro in the early 1980s as part of the Liard River investigations. 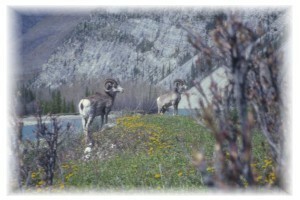 The Fort Nelson Land and Resource Management Plan recommended the area in 1997 as a Protected Area due to the regionally significant hot springs for wildlife, viewing, hiking and First Nations values. In 1999, the area was subsequently designated as a provincial park. Cultural Heritage: Fort Nelson Indian Band and Kaska Dena traditional use area. Conservation: The park occurs within the Muskwa Foothills ecosection of the Toad River valley. The valley has a large active floodplain extensively disturbed by fire that resulted in a diverse vegetation mosaic and important wildlife habitat. A series of hot springs with diverse, thermal-influenced plant communities originate at the base of alluvial terraces on the Toad River. The three main hot springs originate in the middle of an extensive muddy area. The lower river bars around the springs are covered by shrubby vegetation such as glaucous-leaved honeysuckle, common snowberry, western choke cherry and silverberry. The higher terrace hosts alluvial poplar forests with luxurious herb layers that are mainly the result of nutrient enrichment caused by animals visiting the mineral lick. These hot springs are an important mineral lick used by moose and other ungulates. Wildlife: A diverse variety of wildlife species utilize the area. Moose and stone sheep are common to the area as are wolves, and other large predators such as black and grizzly bear. The park is open to hunting. All hunters to the area should refer to the current BC Hunting Regulation synopsis.